Easter Island (Rapa Nui) has been the focus of 119 years of archaeological investigation, most of which was accomplished with the involvement of islanders. In 1886, the first archaeological inventory of coastal ceremonial sites was guided by Rapa Nui, assisted by foreigners living on the island at time, and accomplished by Paymaster W.J. Thomson, officers and crew of USS Mohican. Juan Tepano, 1935. Photo courtesy of Ana Tepano. Katherine Scoresby Routledge, 1910. Photo courtesy of Peter Bucknall. The first real archaeological survey, however, was undertaken in 1913-15 by Katherine Routledge and her husband William Scoresby Routledge, co-leaders of the Mana Expedition to Easter Island. Routledge was assisted by Juan Tepano, her guide and chief collaborator. Alfred Métraux and Henri Lavachery of the Franco-Belgian expedition, 1934-35, were not archaeologists, but their work in ethnography and rock art recording, respectively, was invaluable. They, too, worked with Juan Tepano, but also with Victoria Rapahango and Isabel Chavez. Father Sebastian Englert, who also arrived in 1935, carried on the tradition of inventory by numbering and describing ceremonial sites and statues. He served as consultant to Thor Heyerdahl’s Norwegian Archaeological Expedition. E.N. Ferdon, Jr., one of Heyerdahl’s collaborators, worked with Juan Tepano’s son Jorge. In the 1960s, it was recognized that a precise archaeological inventory of Easter Island was required. 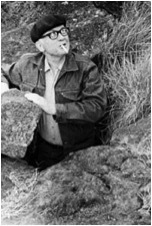 In 1968 American archaeologist William Mulloy, originally a member of Thor Heyerdahl’s 1955 Norwegian Archaeological Expedition, designed an archaeological inventory project with the aim of obtaining a complete description of all sites. His main concern was to protect archaeological sites from potential damage. As the island reasonably can be described as one continuous archaeological site, almost any modern land use will damage potentially economically and scientifically valuable archaeological materials. There is, however, ample land on the island for both modern use into the foreseeable future and also preservation of a large proportion of the archaeological materials and other valuable aspects of the natural environment. Reerection of Statue 51 at Ahu Akivi, from the northwest. Photo courtesy G. Figueroa. Although the island is relatively small, it was presumed that the number of sites eventually inventoried would be large, and that the information collected would be significant. Though the task is vast, requiring the recording, describing and evaluation of endless numbers of small and inconspicuous items, in the long run, it is from materials such as these that important scientific information will come and future economic values will be preserved. In the first stage of work, conducted largely by Patrick McCoy, 1,733 sites were recorded within five quadrangles of 3 by 2.5 km each (a total of 1,973 hectares in the southwest portion of the island). The surveyor was Mario Arévalo P. William Ayres surveyed a discrete 0.6 km section in quadrangle 8, and recorded the surface remains of prehistoric settlement inland from the Tahai ceremonial area. During this same period and later, Mulloy and his colleagues (including Chilean archaeologist Gonzalo Figueroa H. and surveyor Mario Arévalo) investigated and reconstructed important ceremonial sites with monolithic statues. Results were analyzed, reports were published, and Ayres and McCoy based their doctoral dissertations on survey data. Many individual Rapa Nui people collaborated in this work, and the Rapa Nui tourist industry and the island economy benefited directly from it. From 1976-1997 Claudio Cristino F. and Patricia Vargas C., of the University of Chile, initiated their aspect of the Easter Island Archaeological Survey Project. As of 1997, the survey has covered 128 sq. km (80% of the island) in 24 complete quadrangles and sections of another eight. At least 20,000 sites have been identified, and ten original site types were expanded to sixteen. Rano Raraku was established as a discrete 1.2 by 1.1 km region. Between 1979 and 1981, the Chilean team recorded 394 statues (since increased to 397) in Rano Raraku, of which 135 are in the exterior quarries; 15 in the upper exterior quarries; 104 on the exterior slopes, and 46 on the interior slopes. Interior quarries (Sections C and D) were not mapped. In 1981 the University of Chile published the Atlas Arqueologico de Isla de Pascua. It contained topographical maps of six quadrangles surveyed by Mulloy and McCoy with Arévalo P. and 12 surveyed by the Chilean team. Site numbers were assigned to 5,028 sites (including 186 statues) in 8 quadrangles, but no descriptions of either statues or sites provided. Thus, by 1981 a total of 580 statues were known. Cristino F. and Vargas C. conceptualized a series of collaborative research projects that could be carried out within the context of the island-wide archaeological survey. The aim was to conduct discrete investigations with associated researchers, and to share information and publication. Two early projects were the Obsidian Hydration Dating Project (Christopher M. Stevenson, 1981) and the Rock Art Documentation Project (Georgia Lee, 1981). A third project, El Proyecto de Estatuaria de Isla de Pascua, was originally based upon fifty-five discrete statue measurements identified while mapping Rano Raraku quarry. It was hypothesized that, when analyzed, these data would produce a statue typology and other insights into the role of sculpture in Easter Island prehistory. 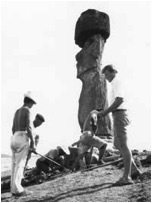 In 1982, Jo Anne Van Tilburg became an associate researcher of this effort, leading to the Easter Island Statue Project and the continuation of the moai inventory. In 1989, Cristián Arévalo Pakarati, son of Project Surveyor Mario Arévalo P., joined Van Tilburg’s field team, and in 2000 was named Project Co-Director. His maternal great-grandfather is Juan Tepano, Katherine Routledge’s chief collaborator. -Ayres, W.S. 1988. “The Tahai Settlement Complex.” In Cristino F., P. Vargas, R. Izaurieta and R. Budd P. (eds.). Archaeology, Volume I First International Congress, Easter Island and East Polynesia, 95-119. Santiago: FAU, Instituto de Estudios Isla de Pascua, Universidad de Chile. -Cristino F., C., P. Vargas C., R. Izaurieta San Juan (eds.) 1981. Atlas Arqueologico de Isla de Pascua. Santiago: Facultad de Arquitectura y Urbanismo and Centro de Estudios Isla de Pascua. -McCoy, P.C. 1976. Easter Island Settlement Patterns in the Late Prehistoric and Protohistoric Periods. Bulletin 5 Easter Island Committee, International Fund for Monuments, Inc. New York. -Mulloy, W. and G. Figueroa 1966. The Archaeological Heritage of Rapa Nui. Sección de Monumentos y Museos, Unesco. Paris. -Van Tilburg, J. and Vargas C., P. 1998. “Easter Island Statue Inventory: A Status Report.” In P. -Vargas C. (ed.) Easter Island and East Polynesian Prehistory, 187-194. Proceedings of the II International Congress on Easter Island and Eastern Polynesian Archaeology.Santiago: FAU, Instituto de Estudios Isla de Pascua, Universidad de Chile.